Track & road gloves developed alongside the Alpinestars top athletes to deliver the highest possible protection. CE-Level 2 approved. Race ahead of the competition: Bringing racing technology at the highest possible level (Moto GP) available to you! If you want to be ahead of the competition, these gloves are the ones that will take you there. Experience the levels of protection and comfort that Alpinestars’ Moto GP riders wear. Comfort is not compromised:The seams will not conflict with the level of comfort that you experience, given the high level of protection, these gloves are amazingly comfortable! Protection a Moto GP rider expects: Keprotech and Kevlar offer high, race levels, of protection with abrasion resistance. Double leather in the key abrasion areas with Keprotech on top help add to your safety. 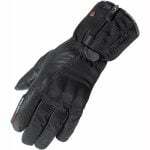 Accordion stretch on the fingers with an Alpinestars patented third and fourth finger bridge helps reduce the risk of snapping the little finger in the event of a slide. TPU hard knuckles, with wrist and finger knuckle protection help to offer impact resistance in the event of an off.